This piece was originally published as part of AJWS’s Chag v’Chesed series. Rabbi Steven Greenberg’s partner, Steven Goldstein, holding his daughter Amalia. My daughter was born in Mumbai, India, between the Hindu and Jewish celebrations of lights—Diwali and Chanukah. We have sweet memories of lighting Chanukah candles in the hotel dining room in India, celebrating the transformation that her birth brought into our lives. Both holidays are likely related to the ancient celebration, Saturnalia, a holiday of lights leading up to the winter solstice. Chanukah appears in this context to be tied to a universal human desire to resist the encroaching night by adding light of our own when the heavens grow dark. Last July I traveled back to India, this time with American Jewish World Service and 17 rabbinic colleagues, in order to understand better how a very small group of people can bring some light to an often very dark place. The community we worked with, Bhakaripurwa, was literally dark at night with no electricity. We were tasked with improving the school for the children of the village. Alongside the capable villagers, we paved the schoolyard so that the children didn’t have to play in the mud during the rainy season, and we refurbished the kitchen and a classroom floors, as well. During our stay we met brave young Indians who challenged an array of accepted norms. We met Dalit (lower caste) Hindu women who work to end the cultural bias of the caste system by running their own newspaper. We talked with women who help communities work together to stem the tide of child marriage, and with a young man who fought to stop construction of a dam that was ruining the ecosystems upon which thousands of people depend. Contemporary Jews often find meaning in Chanukah’s story of the weak overcoming the powerful, which of course resonated for me in India; but there is a Hasidic interpretation of the laws for lighting Chanukah candles that I find particularly meaningful in relationship to what I experienced there. The law prescribes the time frame during which the Chanukah candles can be lit: “from the time the sun set until the passersby cease from the marketplace” (Shulchan Aruch, Orach Chaim 672:1). In other words, we must publicize the miracle of the Maccabean victory over the Assyrian Greeks by lighting candles in a way that they can be witnessed by others. The Hassidic master, Rabbi Levi Yitzchak of Berdichev, plays with the word regel—passersby—and adds the letter heh, creating the word hergel—habit. We must light, he says, until hergel—unthinking habits or routinized behavior—cease. This interpretation really speaks to me after my time in India. We usually go about our habits and routines in life and fail to see what’s outside that rote vision—poverty in far away places; an economic system that elevates profit above all else. We often fail to look beyond the needs of the Jewish community. And we often fail to ask hard questions about our responsibility for others. Rabbi Levi Yitzchak is urging us to break these habits and focus outward. The Talmud discusses this same rule of lighting “till the passersby cease from the marketplace.” “Until when is that?” asks the Gemara. Rabbah bar bar Chanah answers: “Until the tarmodai have left the market” (Babylonian Talmud, Shabbat 21b). The tarmodai were the poorest of the poor, who scavenged for scraps of kindling to sell to people to light their ovens. They were typically the last to leave, and the most indigent venders of the market. Together, these two interpretations teach us that Chanukah challenges us to rouse from our unthinking routines and notice the poorest of the poor, who are, themselves, the caretakers of the light. The brave activists we met in India were asking their leaders to do the same: to recognize their tacit acceptance of oppression, pointing out the routines of culture and market that were daily leading to deprivation, preventable suffering and darkness. And to recognize humanity in the poor, and help them to realize their human rights. At the end of our stay, my rabbinic colleagues and I met with the villagers and had a chance to ask each other some questions. I wondered what holidays they most enjoyed. One man preferred Holi, when friends and enemies paint each other bright colors and embrace. Another chose Diwali, when they light candles to illuminate the darkest days. We chimed in that as Jews, during Chanukah, we also strive to bring light to the shadows. Our festival of light often focuses upon the miraculous success of a small committed band of Jews against the odds. But if our celebrations will truly bring light into the darkness, then we should consider the villagers of Bhakaripurwa and places like it all over the world, where the contemporary tarmodai live. Lighting in solidarity with the brave Indian activists who are risking life and limb to break through the darkest of habits can spur us all to miraculous action. One candle may not seem like much in the face of great darkness, but if we view it as a spark to wake us up from our routines, show us the light in others, and ignite our commitment and power to change the world for the better, then it can make all the difference. 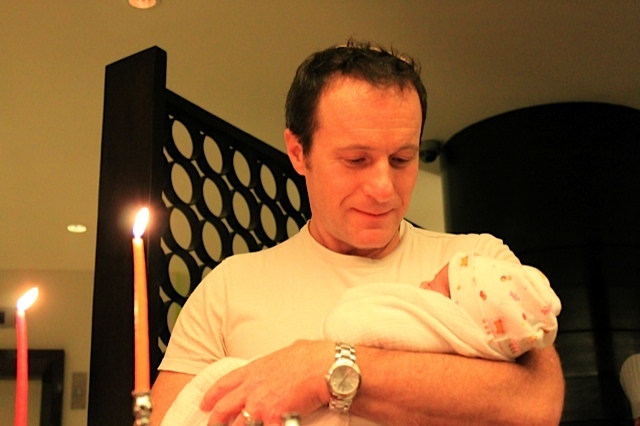 Three years ago, when my partner and I welcomed our daughter, Amalia, into the world, we lit Chanukah candles in that Mumbai hotel dining room. We prayed then, and continue to pray now, that Amalia grow up in a world defined by the great light of the heavens and, in equal measure, by the modest light of the human community that strives to fill all the shadows with illumination. Rabbi Steven Greenberg is one of the founding Co-Directors of Eshel, an organization working to create community and acceptance for LGBT Jews and their families in Orthodox communities. Steve is also a Senior Teaching Fellow at CLAL-The National Jewish Center for Learning and Leadership and serves on the faculty of the Shalom Hartman Institute of North America. Steve has worked with communities around the world to make Orthodox Judaism more inclusive of gays and lesbians. He is the author of the groundbreaking book Wrestling with God & Men: Homosexuality in the Jewish Tradition (University of Wisconsin Press, 2004), which won the Koret Book Award for Philosophy and Thought.